Sherman Minton, 1890–1965. Senator from Indiana, 1935–1941; Associate Justice, United States Supreme Court, 1949–1956. 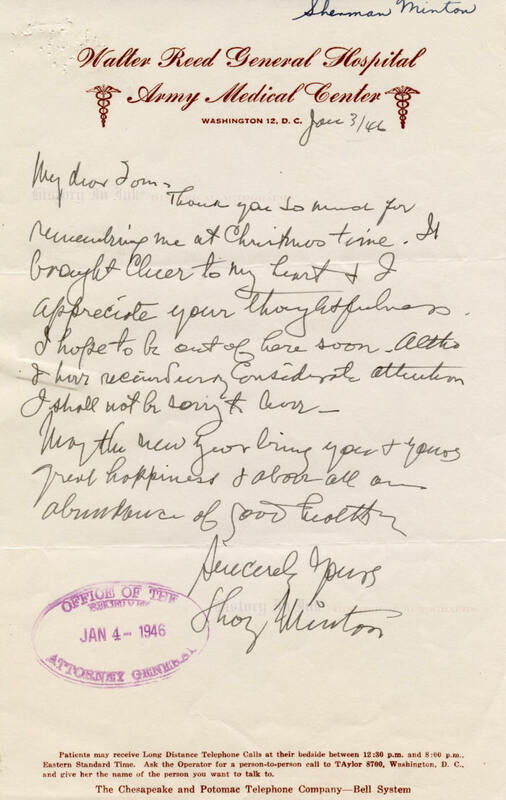 Autograph Letter Signed, Shay Minton, one page, 6” x 9½”, on stationery of Walter Reed General Hospital Army Medical Center, Washington, D.C., January 3, 1946. Minton, a Democrat, was elected to the Senate from Indiana in 1934 and took office in 1935. He served only one term in the Senate and was defeated for reelection in 1940. President Franklin D. Roosevelt appointed him an administrative assistant in the Executive Office of the President for a short time in 1941 before appointing him a judge of the United States Court of Appeals for the Seventh Circuit. He served as a circuit judge eight years, 1941–1949, before President Harry S. Truman, a close friend from his days in the Senate, appointed him an Associate Justice of the United States Supreme Court. He took the oath of office as a Justice on October 12, 1949, and served until ill health forced him to resign on October 15, 1956. Fragile health plagued Minton from this time until he died. He wrote this letter toward the end of a three-month convalescence at Walter Reed after he suffered a heart attack while in Washington in September 1945. After his release, gradually worsening anemia forced him to lighten his workload. Truman offered him an appointment as Solicitor General as they relaxed on the presidential yacht Williamsburg over Memorial Day in 1945, but Minton declined, citing his health. He told Truman, though, that he would be interested in a position on the Supreme Court. Four months later, Truman announced that he would appoint Minton to fill the vacancy created by the death of Justice Wiley Rutledge. Minton has penned and signed this letter in dark gray fountain pen. The letter has two horizontal mailing folds. The Attorney Generalʼs purple oval received stamp is in the blank lower right margin and touches the first letter of Minton’s signature. There is a paper clip impression at the left margin, affecting two words of text, and the words “Sherman Minton” in another hand at the top margin. Overall the letter is in fine condition. Provenance: This letter comes from the personal collection of Justice Tom C. Clark, who served on the Supreme Court from 1949 until 1967. Justice Clark collected the autographs of Supreme Court Justices dating back into the 19th Century, and we are privileged to offer a number of items from his collection. This one comes with the backing page, which bears the federal eagle watermark and Justice Minton’s typed name, that Justice Clark inserted behind the item in the page protector used to house this letter his collection. This letter is not laid down to the backing sheet.